1 LADY OWNER, SATELLITE NAVIGATION, REAR CAMERA, CRUISE CONTROL CLIMATE CONTROL, BLUETOOTH. 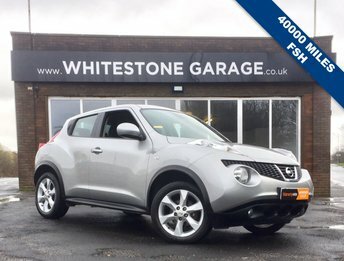 A simply stunning one lady owner top spec Juke that has been cherished from new, it has satellite navigation, rear camera, bluetooth, cruise and climate control, DAB radio, 18 inch alloy wheels, front armest, keyless opening and go, supplied with 2 keys and all of its book packs, a real eyecatching example of this popular car, All of our cars are carefully chosen and come fully inspected, serviced,valeted HPI clear and with a free 12month AA membership, and are given a full years MOT prior to collection, We are well established and have been operating out of our main road showroom for over a quarter of a century so you know that if you purchase a car from us we will still be here if you need us, unlike many dealers who look good on a website but are working from a lock up or rented accommodation and will be gone if you have a problem. A vast amount of sales is repeat business and recommendations. Our customer service speaks for itself. We are here to sell you and your family and friends cars for many years to come. We do not have high pressure salesmen as we believe our cars sell themselves but all of our staff have a minimum of 30 years motor trade experience mostly with Whitestone Garage, nobody here will be trying to sell you extended warranties or get you to sign up as soon as you walk through the door, we just offer good old fashioned service in a friendly environment. Viewing is available 7 days a week at our showroom in Blackburn, Established in 1981 all of our stock is handpicked for being the most desirable spec in faultless condition with carefully researched history, We are registered with the FCA and as such are licensed to offer credit with all major finance companies allowing us to offer competitive PCP and HP deals. We usually carry up to 60 handpicked cars in stock all priced very competitively taking into account condition and mileage, Part exchange is welcome, We do not charge admin fees and we arrange all contact with DVLA including road tax and refunds and cherished number transfers, Up to 3 years extended warranty available on this car. 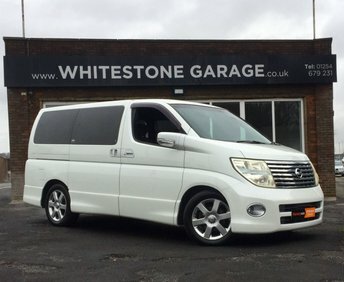 Fresh Import, 8 SEATER, we usually carry a large stock of Japanese 8 seaters, top spec, top grade, 2.5, 8 seater, fully uk registered this must be the nicest Elgrand available with electric remote sliding side door, swivel captains seats, rear camera, retractable mirrors, privacy glass, overmats, front and rear climate control, remote control for rear climate, all of our imports are carefully chosen by our experienced team in Japan who have been buying Japanese imports for us since 2000, supplied with original Japanese paperwork verifying the mileage and grade of this car, an excellent MPV or ideal base for camper conversion, this car drives like a dream and is a real credit to its previous owner. All of our cars are carefully chosen and come fully inspected, serviced,valeted HPI clear and with a free 12month AA membership, and are given a full years MOT prior to collection, We are well established and have been operating out of our main road showroom for over a quarter of a century so you know that if you purchase a car from us we will still be here if you need us, unlike many dealers who look good on a website but are working from a lock up or rented accommodation and will be gone if you have a problem. A vast amount of sales is repeat business and recommendations. Our customer service speaks for itself. We are here to sell you and your family and friends cars for many years to come. We do not have high pressure salesmen as we believe our cars sell themselves but all of our staff have a minimum of 30 years motor trade experience mostly with Whitestone Garage, nobody here will be trying to sell you extended warranties or get you to sign up as soon as you walk through the door, we just offer good old fashioned service in a friendly environment. Viewing is available 7 days a week at our showroom in Blackburn, Established in 1981 all of our stock is handpicked for being the most desirable spec in faultless condition with carefully researched history, We are registered with the FCA and as such are licensed to offer credit with all major finance companies allowing us to offer competitive PCP and HP deals. We usually carry up to 60 handpicked cars in stock all priced very competitively taking into account condition and mileage, Part exchange is welcome, We do not charge admin fees and we arrange all contact with DVLA including road tax and refunds and cherished number transfers, Up to 3 years extended warranty available on this car. A lovely MPV it has a good spec that includes alloy wheels, Bluetooth, cruise and climate control, rear privacy glass, multi function steering wheel, electric windows and mirrors, 2 keys and service record showing services at 7/12/19/27000 miles and the car will be given its 40000 mile service before delivery, it is a lovely well cared for example of this popular car. All of our cars are carefully chosen and come fully inspected, serviced,valeted HPI clear and with a free 12month AA membership, and are given a full years MOT prior to collection, We are well established and have been operating out of our main road showroom for over a quarter of a century so you know that if you purchase a car from us we will still be here if you need us, unlike many dealers who look good on a website but are working from a lock up or rented accommodation and will be gone if you have a problem. A vast amount of sales is repeat business and recommendations. Our customer service speaks for itself. We are here to sell you and your family and friends cars for many years to come. We do not have high pressure salesmen as we believe our cars sell themselves but all of our staff have a minimum of 30 years motor trade experience mostly with Whitestone Garage, nobody here will be trying to sell you extended warranties or get you to sign up as soon as you walk through the door, we just offer good old fashioned service in a friendly environment. Viewing is available 7 days a week at our showroom in Blackburn, Established in 1981 all of our stock is handpicked for being the most desirable spec in faultless condition with carefully researched history, We are registered with the FCA and as such are licensed to offer credit with all major finance companies allowing us to offer competitive PCP and HP deals. We usually carry up to 60 handpicked cars in stock all priced very competitively taking into account condition and mileage, Part exchange is welcome, We do not charge admin fees and we arrange all contact with DVLA including road tax and refunds and cherished number transfers, Up to 3 years extended warranty available on this car. If you're looking for a fun city car, a spacious family hatchback, a sporty crossover or a serious off-roader, Nissan is a manufacturer worth serious consideration. The Nissan Micra is a class-leading supermini, while the firm's Juke model set the standard for crossover vehicles. Browse the complete range of used Nissan cars for sale in Preston here on our website and let a member of our team help you find a great deal on your next pre-owned vehicle. 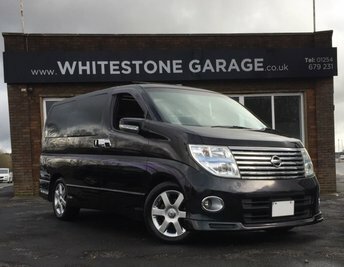 Here at Whitestone Garage we have a reputation for supplying quality used cars at affordable prices and we ensure that every vehicle is thoroughly tested before going on sale. Start the search for your used Nissan today.